Hmmmmm............not too sure about this one.......what do you guys think? It’s a little rich for my blood. It looks to be in very nice condition. I like that it appears to have the early style door moldings still on there. Interior looks flawless including the interior door panels that usually go to crap on the 87s. It’s a bummer it’s not a 5-speed G92 or a 5.7. If it were $19,000 I’d consider it. I understand that would be a deal. We're at this kinda surreal crossroads between form and function and collectors and drivers. I'd prefer a 5.7 or a 5 speed, with a few more miles that I could drive. Still, this is pretty darn clean and obvious low miles. As the value goes down for one of us, it goes up for another. So hard to set a price on these cars right now. For some reason I've always had a soft spot in my heart for the black and gold ones. I used to have a maroon 87 IROC. It had the 5.7, auto dim mirror, overhead console, t tops, etc. The only options it didnt have were leather and bose. I wonder if it was also the 1sc option? My maroon 87 5-speed was the same. Overhead console with the “Camaro” flashlight, Auto dim mirror, power everything and T-tops. Leather and Bose were the only missing options. 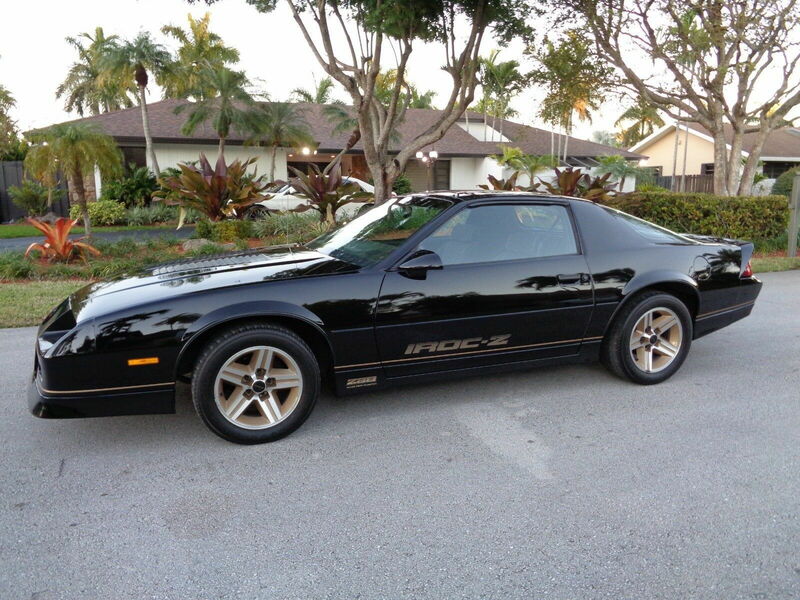 Original owner even had an IROC-Z bra that came with the car.. I wish I kept that.. It had an alarm with keyless entry which I actually liked but that was aftermarket.. I can’t really tell, pics are a little blurry..
I’m just looking on iPhone though..
Wonder how it looks in person..
First let me say that I love this forum. It's been, and hope it will continue to be, super helpful to me. You guys really know your isht. I personally hope the seller gets top dollar for the car. Should we not all be pulling for that? Welcome to the forum! I've learned pretty much everything I know about cars from this forum over the last 18 years! ....Pretty much. Dad got me started when I was young! We want to see values increasing, but that's not always the same as prices. Economics is pretty much blind to what your product is, and it's trends are pretty universal. We want values to go up, but different cars, colors, options, years, etc. etc will inherently carry different value. ...and with no real market standards, prices are all over the place. If this car is truly WORTH $26k, then yes, I hope it gets every penny of it. But when a $18k dollar car gets $26k, it can temporarily create higher prices and values, creating a bubble, then eventually it'll pop and all prices drop, regardless of value. ....the question is what are these cars really worth? ....and we don't really know. When interest drives up prices it's good. When high profile dealers drive up prices, it's bad....at least in the long term. In real estate, I know slow and steady appreciation is the fastest appreciation. Peaks and valleys are great it you're in the right place at the right time, but overall growth is slower. I 100% get what you're saying. And i guess my opinion would be different if i were on the buy side of the market. I do get frustrated w/"flippers" particularly in real estate because that has such an impact on so many people's lives. I hate that california based flip or flop show for that very reason, but they wouldn't be able to sell the houses at the exorbitant price if the market was unable/unwilling to pay... again complicated by the fact that the buyer is not really using their own money, they're using the bank's money. But i digress. In this case though, as the owner of a low mileage unmolested "survivor" '88 IROC, I would like to see the prices go up regardless the reason. I tried briefly to sell the car and listed it at $15k and got yawns. Then had some offers in at $10k or lower. so, based on economic principles the car was "worth" exactly that. $10k or less. Essentially, yes, economics is blind to the product, but the "price" is exactly what someone is willing to pay for the product, all other factors aside. Value is more subjective and open for debate. In my case, the "value" of the car to me, exceeded the price the market was willing to pay. therefore i decided to keep it. Last edited by Wookiee; 02-04-2019 at 11:05 AM. Don't get me wrong, I'm all for whatever is best for the community, and that means increasing values. History has just shown that slow steady appreciation is better for long term value than artificially inflated prices. ....whether or not that's the case here isn't the issue. That's for others to decide. ....and (you) as the owner of one of these survivors, who may be looking to sell, I would agree that ANY appreciation, regardless of the reason would certainly benefit you! This is how I see it.. there’s a weird room in the pricing right now.. There is a little bubble going on.. I don’t know how you tried to sell your car but I have sold a lot of high ticket items where some of my friends have no luck. You have to really present the item and really showcase the positives and really sell people on the product. Save documentation and display it to show how serious you collect and maintain your items. Have amazing photos and even video and try to eliminate any doubt. Be upfront about flaws, but stand by your assessment of the item just to eliminate surprises that will turn into haggling points. Basically campaign the item and show and describe everything that would give you confidence to buy..
I’m not saying you’re not a good seller, but some people are really good at selling online and some people really struggle. You need to wow people with your ad.